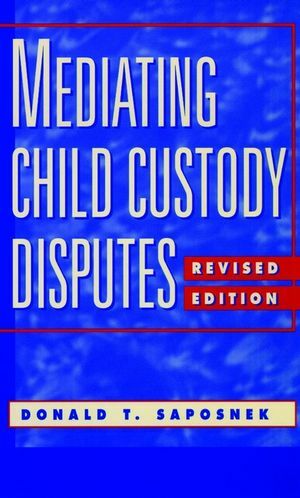 Seasoned mediator Donald Saposnek has revised and updated his classic primer which offers the most current information on issues and procedures concerning child custody mediation and includes important updates on new research and laws. Using metaphors drawn from Aikido, Saposnek's compassionate book offers guidance for developing the essential therapeutic skills and mediation techniques that will help solve difficult problems and create cooperation. DONALD T. SAPOSNEK is a clinical-child psychologist, director of Family Mediation Service of Santa Cruz, California, and a psychology faculty at the University of California at Santa Cruz. He is on the editorial boards of the Mediation Quarterly and the Family and Conciliation Courts Review, and he is the editor of the Academy of Family Mediators' Mediation News. PERSPECTIVES ON CHILD CUSTODY MEDIATION. Mediation as a Cooperative Problem-Solving Approach. The Needs of Children Through Divorce. Attitudes and Skills Needed for Effective Mediation. The Strategic Approach: Aikido as a Model for Mediation. Beginning Mediation: Setting the Context for Negotiations. Phases of Mediation: From Gathering Information to ReachingAgreements. STRATEGIES USED BY CHILDREN, PARENTS, AND MEDIATORS.Parents'Motives and Methods in Custody Disputes. Strategies for Eliciting Cooperation Between Parents. Skills and Techniques for Managing Conflict. Case Study #1: A Less Complex Case. Case Study #2: A More Complex Case. Ethics, Values, and Morals in Mediation. Making Mediation Work: Recommendations for Mediators, Attorneys,and Judges. Appendix A: Uniform Standards Of Practice For Court Connected ChildCustody Mediation For the State Of California. Appendix B: Academy of Family Mediators Standards Of Practice ForFamily And Divorce Mediation. Appendix D: Pre-Empting Statement Categories For Commencing ChildCustody Mediation. Appendix E: List Of Strategies Of Used By Spouses, Children, AndMediators. Appendix F: Sample Mediation Agreements. "The seminal work in systems theory applied to mediation, this willbe invaluable to all practicing mediators as well as otherprofessionals involved in custody disputes."